The best Welsh cakes I have ever tasted! The addition of the nutmeg give them a wonderful flavour. Griddle needed for cooking – pre-heat on top of cooker, on a large ring at the lowest temperature, whilst you mix the ingredients. 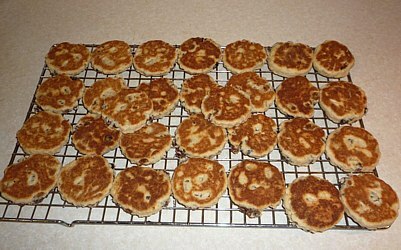 It will then be just the right temperature for cooking when you have cut the first batch of Welsh cakes. 2. Add the caster sugar and mixed dried fruit, mix together thoroughly. 4. Divide dough in half, and roll out first half onto a floured board to a quarter-inch thickness, and cut into rounds, using a pastry cutter. 5. 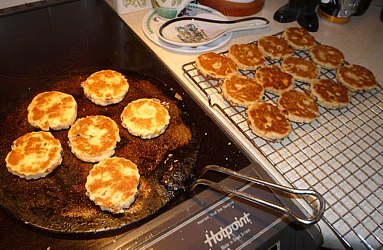 Grease the griddle with a butter-paper and a small knob of margarine / butter, then put the first batch of Welsh cakes on to start cooking. 6. As these cook, continue to roll out and cut the next batch. The Welsh cakes need to be turned after about 3 minutes, and cooked on the other side until golden brown. Cool on a rack before storing in an air-tight tin.